Agriculture is a strategic sector in many regions around the world. In those regions where water scarcity is an endemic problem, crops tend to suffer hydric stress which make them prone to suffer from pests and diseases. Thus, periodic checks to detect those pests are crucial to prevent and act upon them on early stages. Portable smart devices like phone mobiles or tablets offer Internet connectivity and camera devices. These two properties make them a potential tool that can be used for this work: to make an in situ early detection of the pest or disease that could help to reduce the negative impact of these on the affected crop and so minimize economic loss. 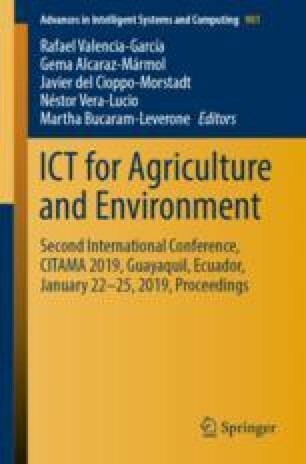 In this work we propose an application prototype that can issue a diagnosis and its related treatment from a photograph of an affected crop taken by the user anytime/anywhere. This is achieved by using a combination of different technologies such as Convolutional Neural Networks and REST services, among others. The first tests with a reduced set of crops and diseases resulted in an accuracy over 90%.